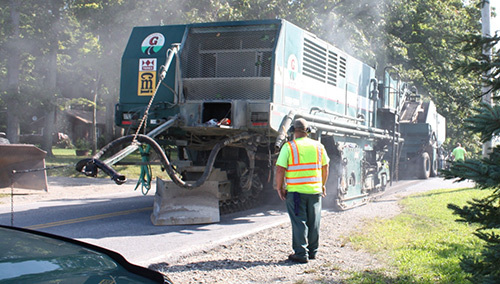 Dutchess County’s Annual Pavement Management Program uses a variety of different pavement treatment options to extend the life of the County’s roadways, while improving the ride-ability and safety of the County highway system. Specialty Surface Treatments: (Paver-Placed Surface Treatment, Fiber Mat w/ surface treatment, Slurry-Seal & Chip-Seal) - These treatments are used on roads in good shape to provide a new wearing surface. Some of these treatments are for low traffic volume roads or to add traction to road with slippery surfaces. Hot Mix Asphalt (HMA) resurfacing - This process adds 2 inches of new pavement on top of roads that are in good shape to provide a new riding surface and extend the roads’ life. Hot In-Place Recycling - This treatment heats and rejuvinates the top course of the road (approximately 1 - 1 1/2 inches) to prep the road to receive a new riding surface. It is used on roads with a good profile to fix problems with the surface. 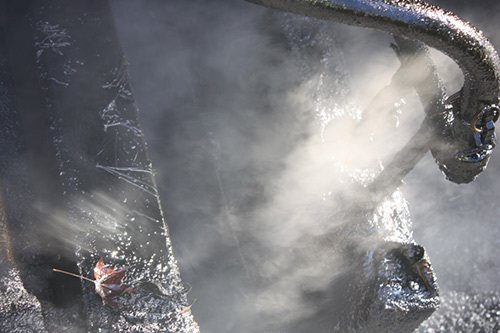 Cold In-Place Recycling - This process grinds up approximately the top 4 inches of the existing pavement and subbase, mixes it with emulsion and replaces it. The treatment corrects the road’s profile and removes potholes, while recycling the material (requiring that less virgin material be added) and prepares the road to receive a new riding surface. The goal of the annual program is to maintain County Highways in an average to excellent condition by addressing deteriorating pavement conditions well before a total rehabilitation of the roadways are necessary. This saves the county money, maintains the safety of the travelling public and diminishes regular wear and tear on vehicles that use the system. The following slides show the advantages of having an annual program, instead of just letting the roads deteriorate until they need to be rebuilt. A Pavement Scoring System, which objectively rates the condition of the pavement on County Routes, basis on an annual visual inspection.